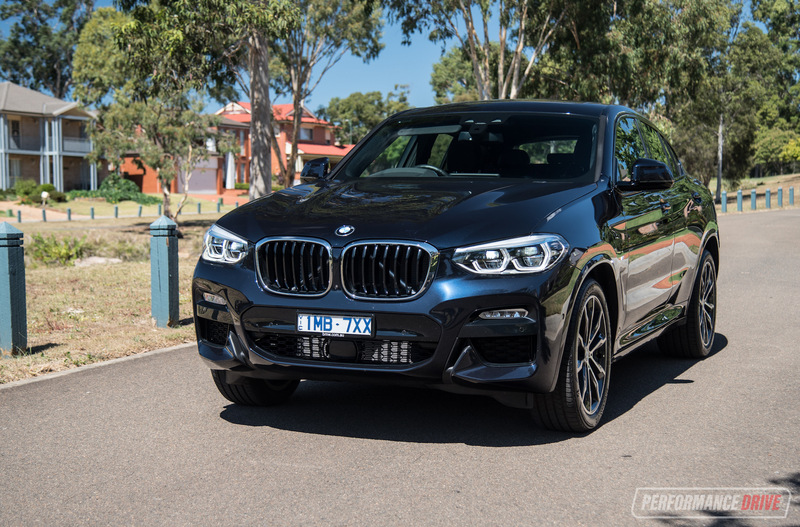 Prospective SUV buyers are spoilt for choice when it comes to BMW’s extensive range. The German company now offers no less than seven SUVs. That’s right. Seven. 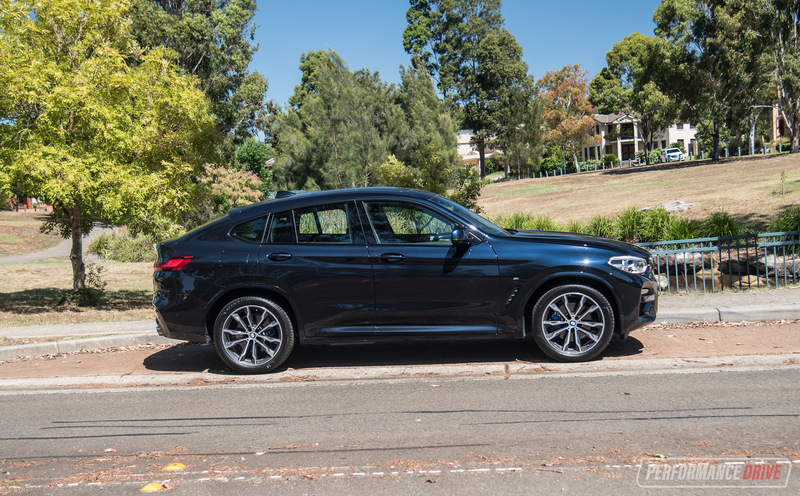 The X4 we’re reviewing here slots itself in as a mid-sizer that inherits a relatively new coupe shape and dynamics, while still offering the SUV benefits of being higher off the ground and offering room for a small family. 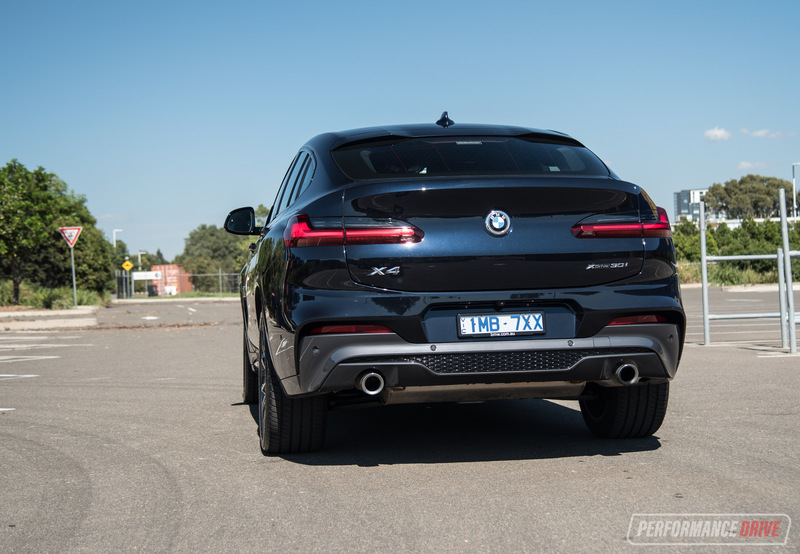 With its unique shape eloquently named the “Sports Activity Coupe”, the BMW X4 shares the same CLAR-based platform as the X3. 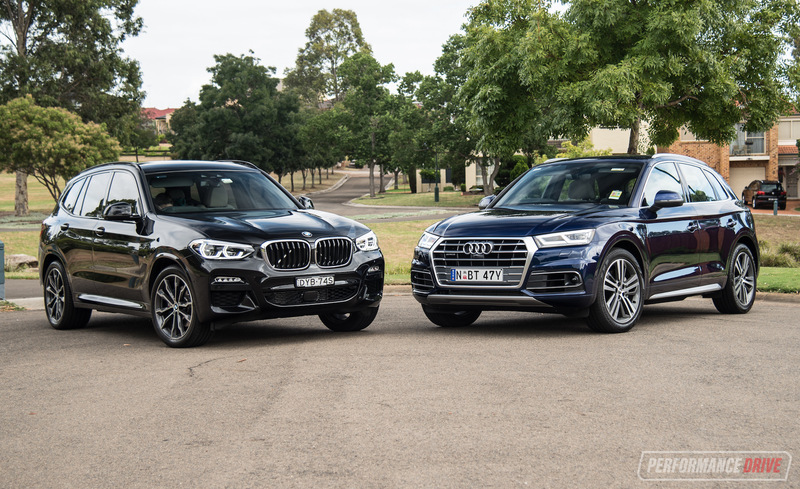 It goes head-to-head with the likes of the Mercedes-Benz GLC Coupe, Range Rover Velar, and the Porsche Macan. 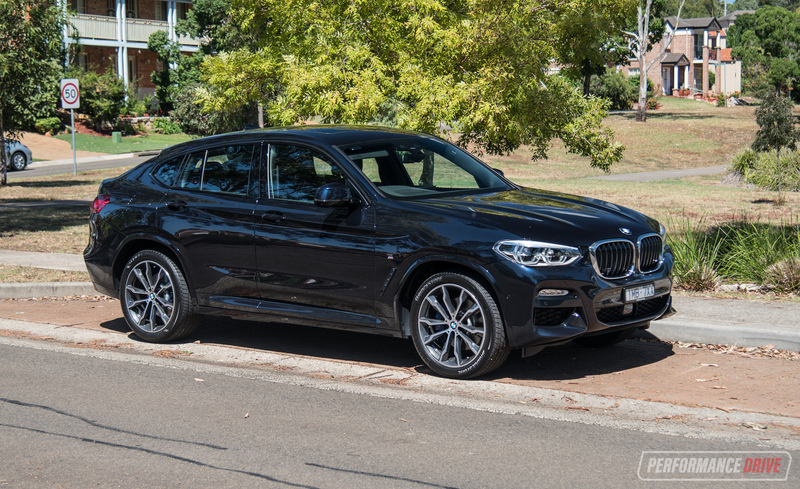 Covering four model grades, the all-AWD X4 range starts with the entry-level 135kW/290Nm xDrive20i 2.0-litre turbo-petrol, then steps up to the 140kW/400Nm xDrive20d diesel, the 185kW/350Nm xDrive30i that we’re reviewing here, and at the top, the 265kW/500Nm M40i M Performance version that uses a 3.0-litre turbo inline six. 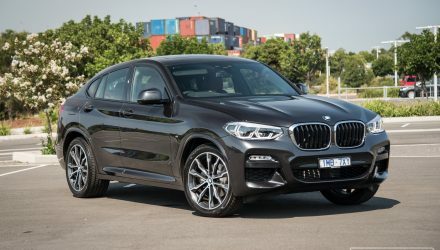 All X4 models come with the M Sport pack as standard (other trims available as no-cost options) and come with an eight-speed auto transmission. 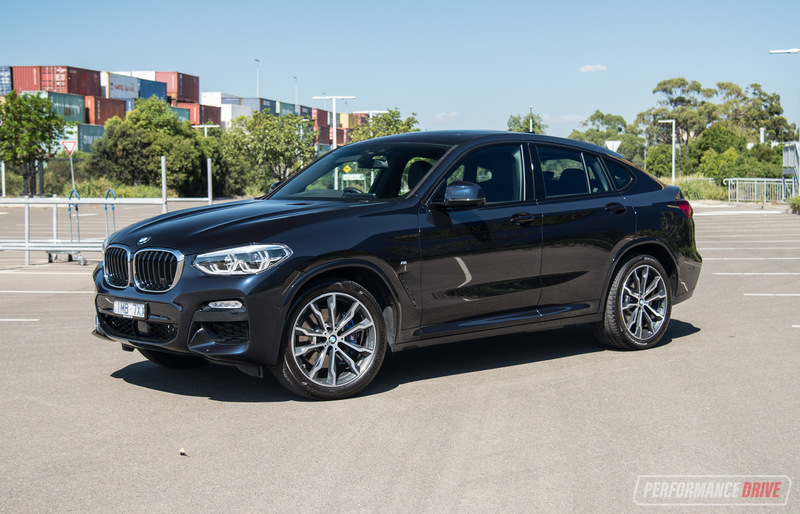 Prices begin at $76,900 (excluding on-road costs) for the base xDrive20i – which is about $14k more expensive than the BMW X3 20i, but about $1600 cheaper than the most affordable Mercedes GLC Coupe rival. 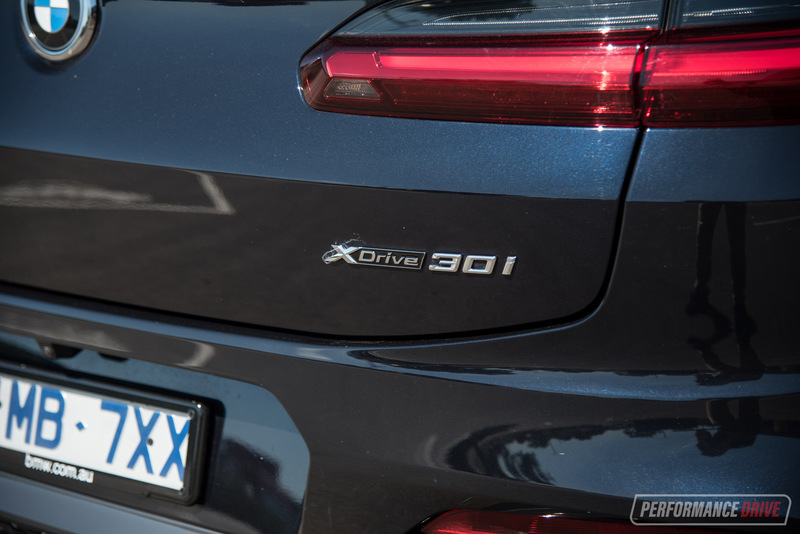 This tested xDrive30i will set you back at $83,900 (excluding on-road costs and optional extras). 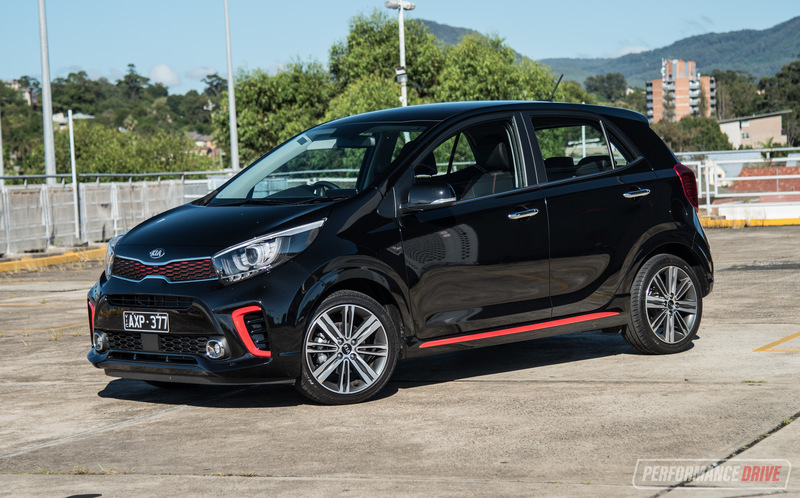 Love it or hate it, the “Sports Activity Coupe” is a new archetype that moulds together the advantages of all other car shapes (except the ute) into one unit. What does it mean in terms of appearance? 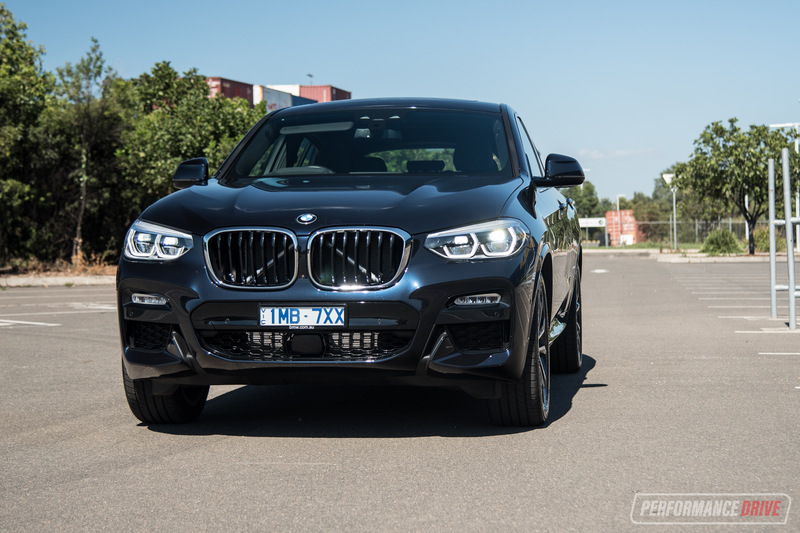 In the X4’s case, the front takes on a design language similar to most other BMW SUVs. It’s an angry and powerful stance with lots of flowing contours running through the body. At the rear, a light, athletic coupe appearance shines through as the roof slopes down more gradually to the end of the body. All the while being higher off the ground than a coupe, giving drivers that high-riding, confident feel. 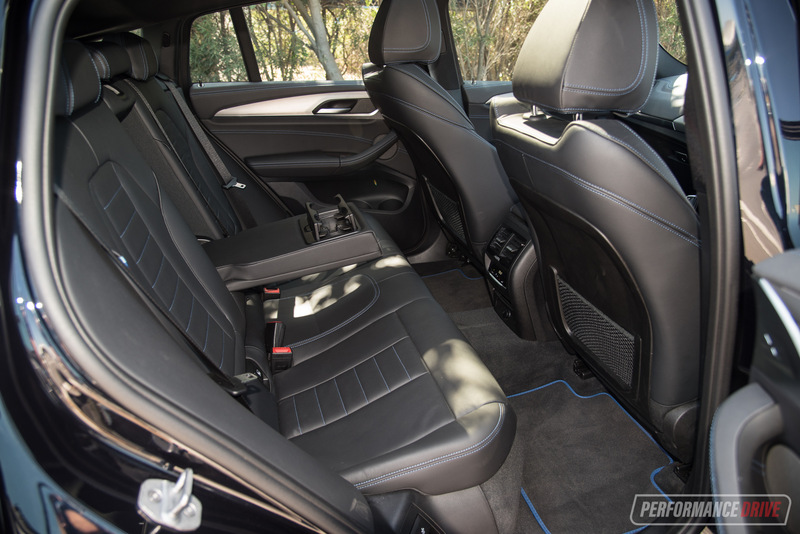 On the inside, the interior adopts the freshest design elements on the market today. Yet, it still obtains some subtle, uniquely-BMW impressions. The centre dash layout still uses that hexagonal shape to harbour all the buttons and controls. But it has been modernised beautifully. The digital instrument cluster now looks class-leading with its crisp, flat and simplistic arrangement. It’s very easy to glimpse while driving. European luxury cars don’t seem to replicate practical interior spaces like cheaper SUVs. The X4 isn’t terrible at being practical – it has the standard big bottle holders in the doors, an average-sized centre console, and a wireless charging pad for your phone. But it misses the airy cabin feel and storage solutions of other cheaper SUVs. BMW might argue that it goes for a more premium feel that wraps snug around you. But we think the two don’t have to be mutually exclusive. Nevertheless, the X4 provides avant-garde comfort levels. 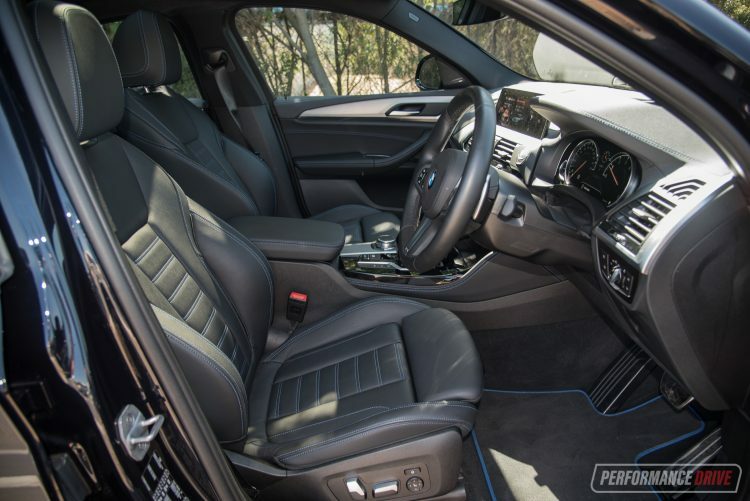 The front M Sport seats have more adjustments than you will probably care to use, including moveable side bolsters, and the materials and leather used is as premium as they come. Even in the second row, the seats offer lounge room quality, and passengers back there have their own air conditioning controls. When seated in the rear, only the tallest of passengers could see their knees hitting the back of the front seats. 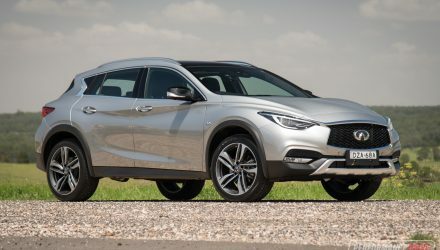 Their head might come close to the roof too due to the swooping roof profile, however, the coupe design doesn’t impede on rear headroom as much as you might think. 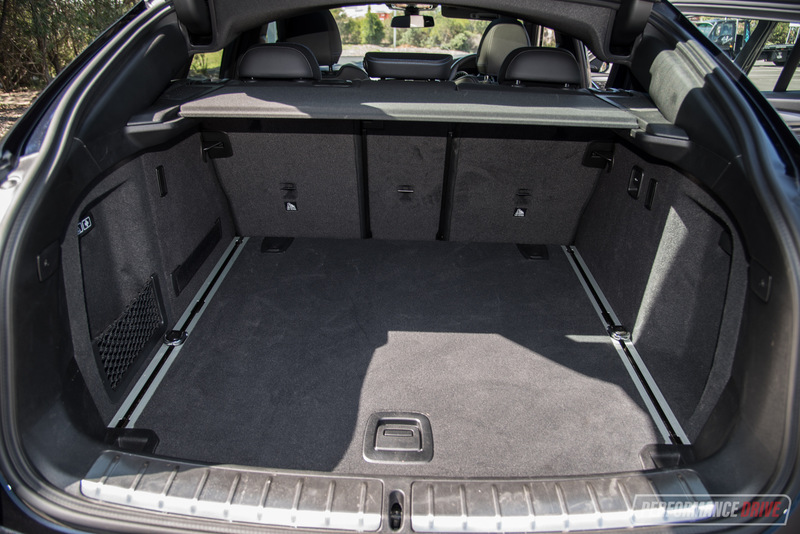 The all-important boot space officially measures in at 525 litres, or 1430 litres with the rear seats folded down. To put things into perspective, this makes it larger than the Mercedes-Benz GLC Coupe (500L/1400L) and Porsche Macan (500L/1500L), but smaller than the 2.0T Range Rover Velar’s 558L/1616L. 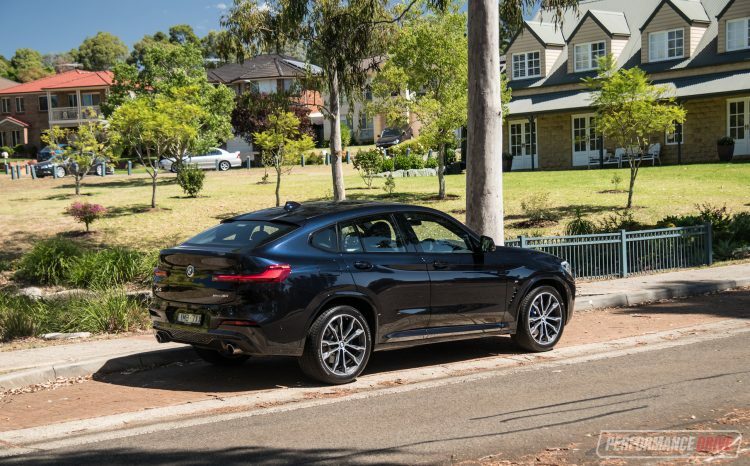 The X4 uses run-flat tyres to save on boot space, which might not suit people planning to travel on the dirt frequently. 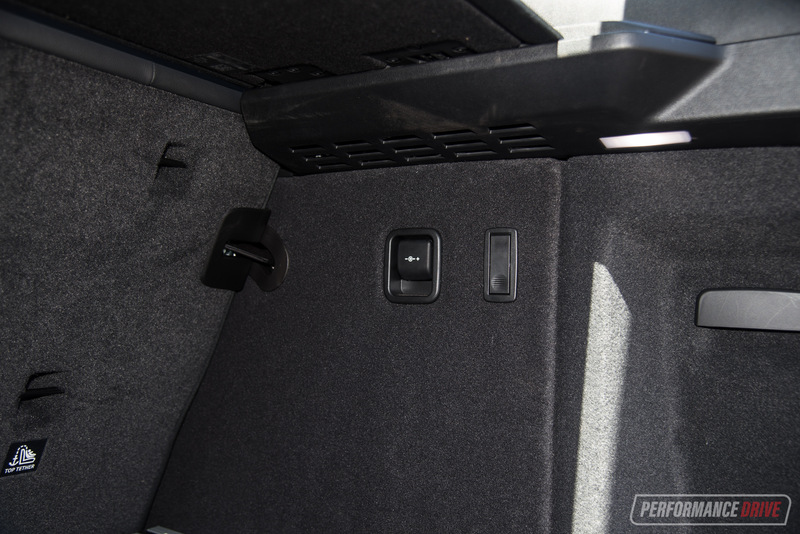 In the boot area you also receive under-floor storage, and there is a 12V socket in the wall. There’s also some pull-tabs to fold down the rear seats from the back. 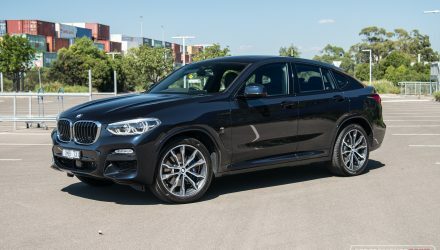 All X4 models come standard with autonomous emergency braking with forward collision warning and pedestrian detection, lane-keeping assist, driver attention alert, blind-spot sensors, front-, rear- and side-view cameras, front and rear parking sensors, head-up display, road sign recognition, power tailgate, selectable driving modes, and 19-inch alloys. 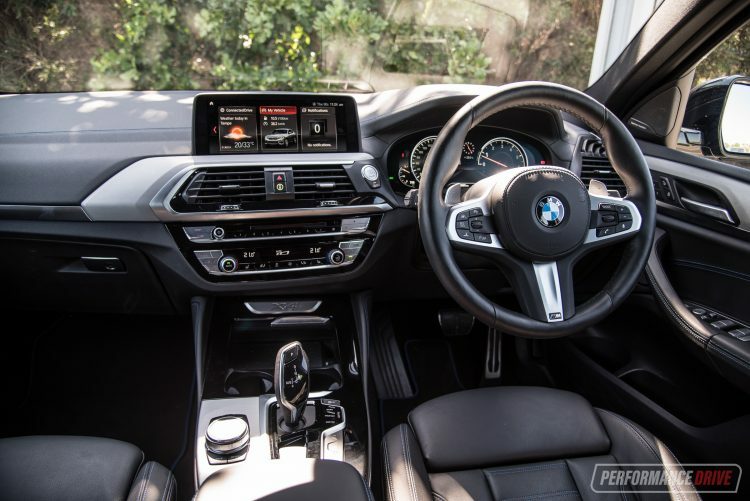 The xDrive30i M Sport also receives adaptive cruise control with steering assist, the advanced digital instrument display, active cornering headlights with auto high-beam, and bigger 20-inch alloy wheels. 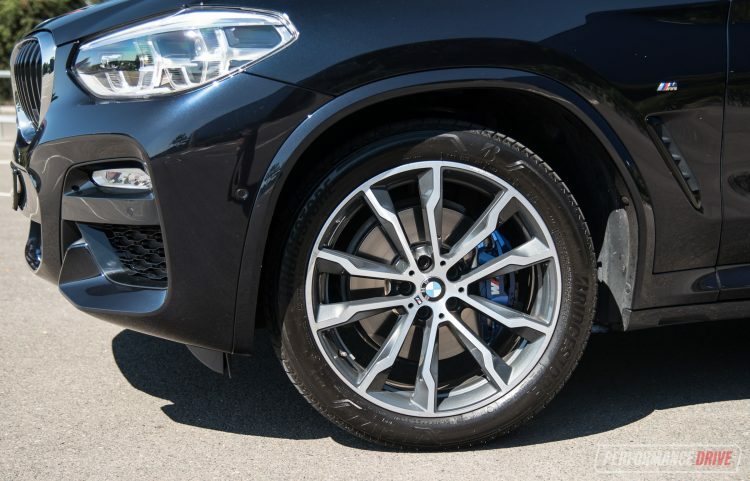 Behind the wheels are some proper M Sport brakes with multi-piston front calipers, not seen on lesser X4 variants with the M Sport pack. Our test car was fitted with the optional 16-speaker sound system, which as you would expect, sounds as good as a cinema. Otherwise you get a six-speaker sound system. Digital radio is standard across the board. 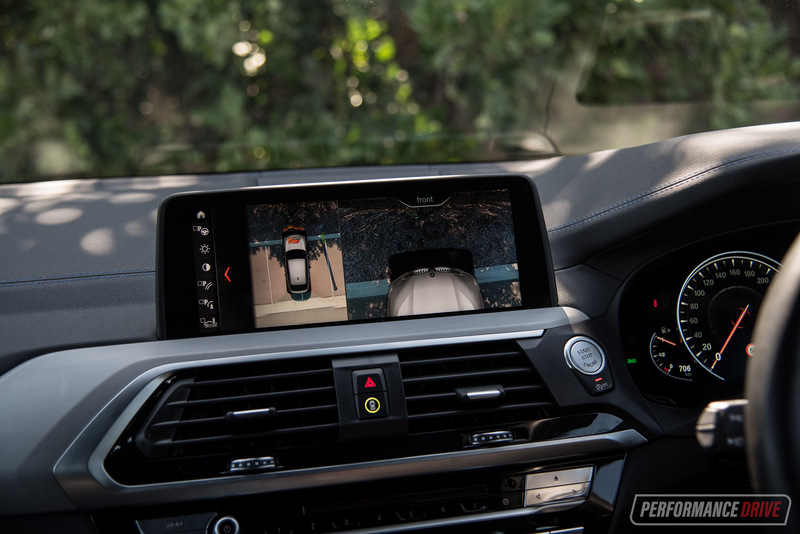 It is controlled by a wide twin view 10.25-inch screen that is navigated by BMWs famous joystick wheel combination on the centre console which it calls iDrive. It takes a little getting used to, and we like it as a solution to fumble through such a large range of options often seen in today’s cars. Some people might not like it though, so give it a good test before buying. The screen also offers touch-screen functionality if you prefer. Unfortunately, BMW makes you pay $623 extra for Apple CarPlay. C’mon, BMW, don’t your customers pay enough already? 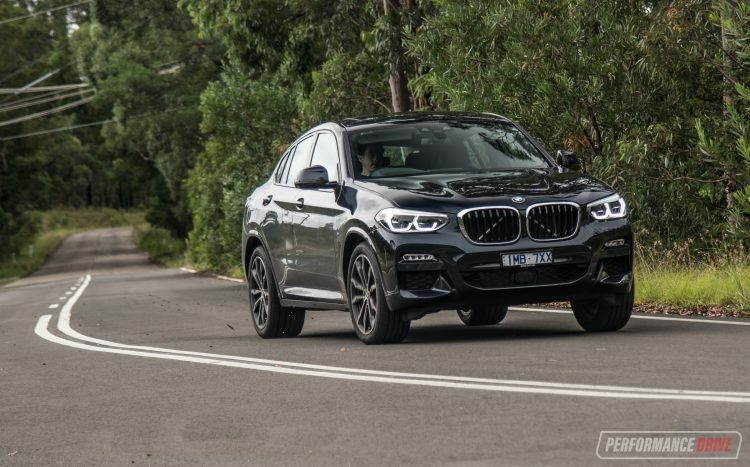 Like all new BMW models, the X4 is covered by a three-year/unlimited kilometre warranty. 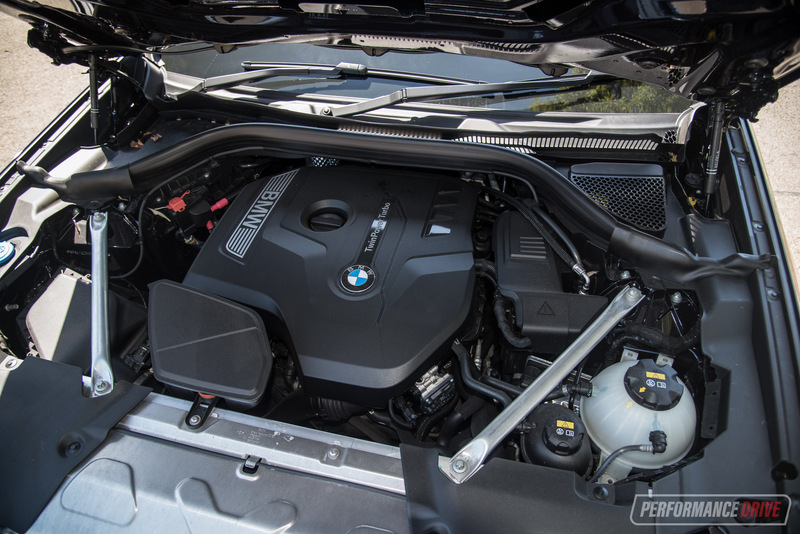 Our favourite part of the X4 is under the bonnet. The xDrive30i ‘B48’ engine is smooth, responsive and sounds brilliant. The selectable driving modes change the characteristics of the drive significantly, too. Leaving it in the standard mode will have the engine act more sedately for economy, and sport mode makes it all come alive. Even though the full 185kW doesn’t kick in until 6500rpm, it feels consistently powerful throughout the power band. With 350Nm of torque starting at a low 1450rpm, the mid-range punch is impressive, especially in sport mode. 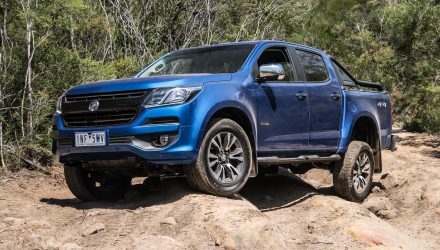 It also makes for a great cruiser on the freeway, with the faultless ZF-based eight-speed auto helping to keep the engine revs low at higher speeds. Official figures rate 0-100km/h acceleration at an impressive 6.3 seconds. Our testing resulted in a not-too-far-behind 6.64 seconds. 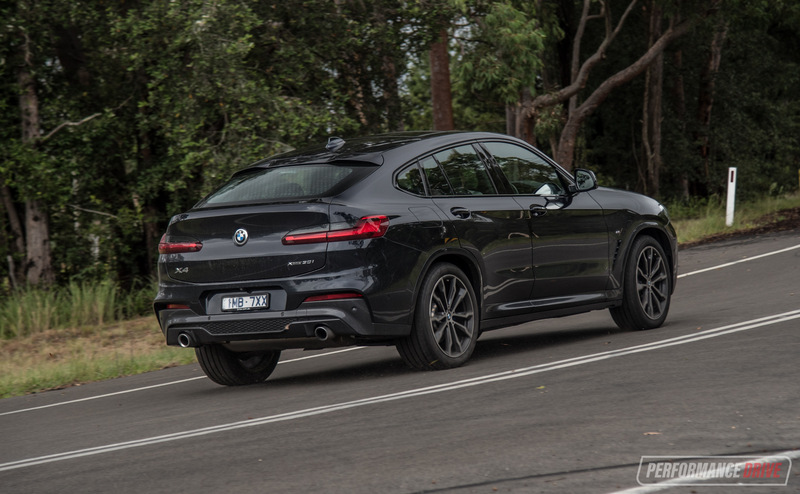 On official claims, this makes it 1.0 second quicker than the 155kW Mercedes-Benz GLC 250 Coupe, and 0.4 seconds quicker than both the 184kW Range Rover Velar P250 and 185kW Porsche Macan 2.0L turbo petrol. In terms of driving dynamics, the US-built Beemer is very European. 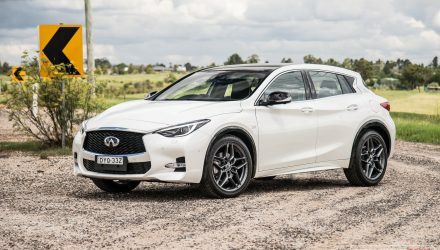 It undertakes corners with coupe-like body control, and gives the right amount of feedback to the driver through the almost perfect steering setup. Those selectable driving modes also alter the electrically-adjustable dampers in this model to give stiffer handling when in sport mode. You can throw it around corners and the grip feels limitless. A comparatively light tare weight of 1678kg means it feels exactly as a BMW should; playful, enjoyable and competent. 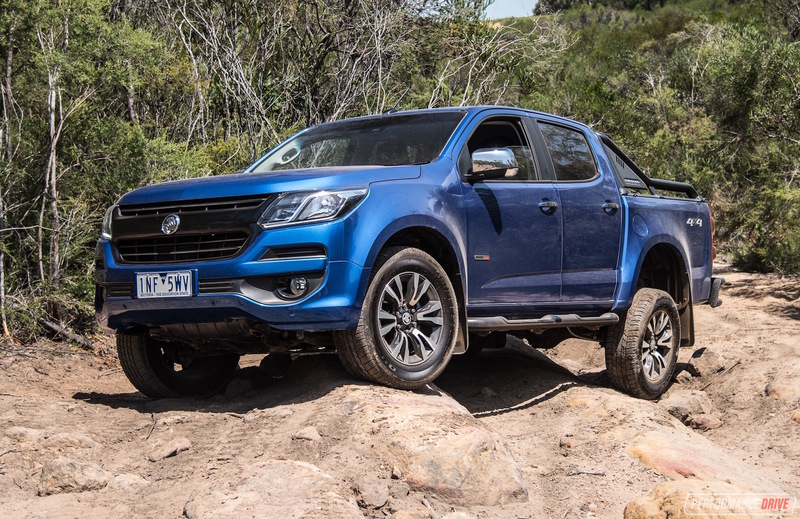 For Australian conditions, the suitably firm ride in sport mode causes an abrupt bounce on rough country roads. Comfort mode scales this trait back to a more pleasant control. We love the fact that power is constantly applied to all four wheels – it’s not an on-demand system like many rivals. This is great for achieving the best grip in wet and slippery situations, and provides outstanding stability and confidence on the road. You can nail it around corners and this thing won’t budge. It tracks true and on your desired line. 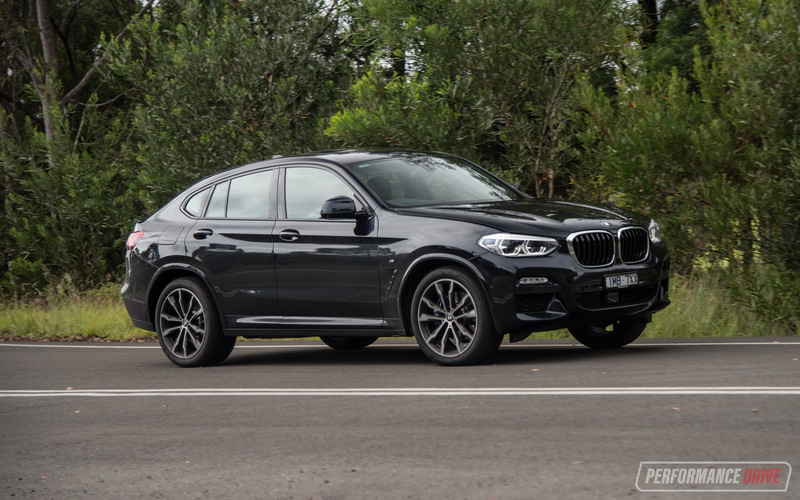 Probably the biggest gripe we have about the X4 is in the refinement of the brakes. They have plenty of pulling-up power, and they provide excellent resistance to fade. However, we found it nearly impossible to pull up to a halt without a to-and fro wobble. Even if you ease off the brake pedal at the last metre, the car jiggles back and forth as it lands to a halt. 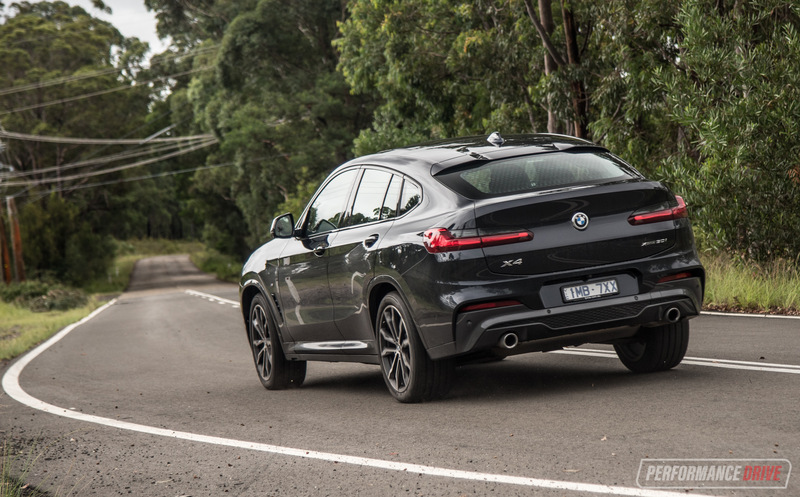 We have no doubt in the performance of the M Sport setup, but this unavoidable swaying makes for an unusually unpleasant stop. Our testing might be harsher than yours, but during ‘sensible’ driving, we weren’t able to achieve less than 9.3L/100km. This is far from the official rating of 7.8L/100km. BMW’s diesel models are much more economical, and tend to achieve real-world averages closer to the official rating. 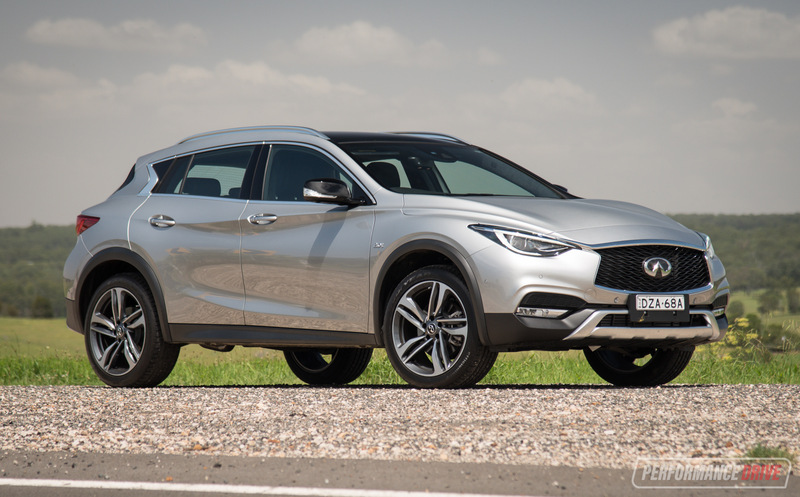 The fuel tank is relatively large, at 65L, which means you could squeeze 700-750km out of a tankful of premium 95RON rated fuel (any lower RON rating is not compatible). It’s worth noting there is an ‘Eco Pro’ driving mode, which provides a handy real-time readout of accumulated extra kilometres that you achieved due to the more relaxed throttle sensitivity in this mode. Try not to be dizzied by BMW’s SUV range, because the X4 has found itself a comfortable spot in a niche market. If you’re after a higher-riding car that still has the impeccable German-engineered dynamics that BMW is famous for, and also portrays a sporty coupe personality, the X4 might be your next date. 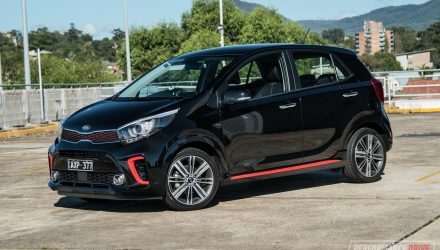 We love the performance of the turbo engine, although it is not as fuel efficient as other engines in the range, nor other cars in this class. We also love the typical class-benchmarking handling and driving enjoyment. 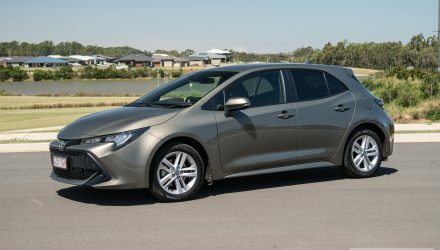 Hopefully your budget will allow for some odd optional extras, because there are some items that you might expect as standard. For example, Apple CarPlay and heated seats, and others. Some of these will send the price north quite quickly.